Rex Chapman on the Whitesburg campus of SKCTC early Monday night. 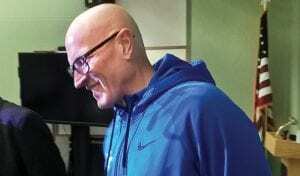 Basketball fans know Rex Chapman as a standout University of Kentucky Wildcat, and a 12-year NBA veteran who once scored 39 points against Michael Jordan. Phoenix, Ariz., police know him as a convicted felon who shoplifted more than $14,000 worth of merchandise from a store and pawned it. He knows himself as an addict who spent 14 years hooked on pain medicines after injuries and surgery. Chapman, who said he’s been clean and sober for more than four years, visited Whitesburg on Monday to speak at a meeting of the nonprofit organization HEAL, Help End Addiction for Life. Chapman had already been taking Vicodin, a prescription drug containing hydrodcodone bitartrate and acetaminophen, when he had to have an emergency appendectomy and his doctor gave him OxyContin for pain. 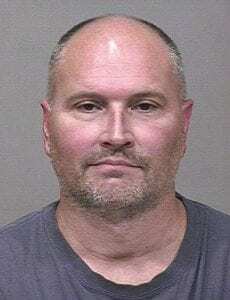 Rex Chapman as he appeared at the time of his arrest on theft charges related to his addiction to pain medicine. Chapman said he had always had anxiety in social situations, and the pills made him think he was better at making conversation. He kept taking them, getting them partly from prescriptions and partly from a friend. “For the better part of 14 years, I was using opioids of some kind,” he said. He stopped the first time after Danny Ainge of the Boston Celtics talked to him and told him he had to go to rehab. At the time, Chapman said, he was taking 40 Vicodin and 10 Oxy- Contin tablets a day. “That day, I took a little more, and I started to drive over there and found myself in a ditch,” he said. He said rehab worked about two years, but he was soon back on Vicodin. “In 2005, they put me on Suboxone, and I was on Suboxone for about nine years and nobody tried to wean me off of it,” he said. While Chapman also said he didn’t feel high while taking Suboxone, a drug intended to get people off opioids, but he still abused it, buying on the street if he was afraid he would run out. He said he never felt “normal” while he was taking it, but it allowed him to function until it started to run out. “I’d start sweating, feeling hungry, then irritable, then mad — mad at everything,” he said. In 2014, Chapman, who made an estimated $32 million playing basketball, got arrested in Phoenix for shoplifting, and it wasn’t just anything he could pick up. Chapman stole more than $14,000 worth of merchandise during nine trips to a store, and hocked it to buy drugs. He was finally caught when a store employee recognized the tall, pudgy man for who he had been — a college basketball and NBA star. His four children found out everything. Chapman went back to rehab, this time in Louisville at The Brook, a chain of behavioral health hospitals run by another former Wildcat, Paul Andrews. When he completed the program, he spent three months in a sober-living home, and then moved to California. He came home to Kentucky two years ago, where he works as a sports commentator and travels to speak about his experience with addiction. In answer to questions from the audience, Chapman said he thought pill addictions were unusual in the NBA, though there is a lot of alcohol abuse and other drugs. Players don’t take opioids much because it is “damn near impossible to play” while taking them. Pills ruined him financially, he said, partly because he also loves to gamble. “Playing the horses and painkillers ? Terrible combination,” he said. He says he’s also addicted to eating, and could gain back the 40 pounds he’s lost in a month, if he were to allow himself to eat what he wants. As to what he says to his kids about drugs, Chapman said it’s things like never take someone else’s medicine, and telling them about the consequences, some of which they saw for themselves because of him.